I am writing this post because I have a recommendation for Facebook Group Admin regarding how blocking and blockers should be handled so that the activities of the Group don’t become a poor reflection on you. For Groups where there’s a divisive theme, for example political debate groups, I am recommending that participants who are blocking admins be removed. The rationale behind this recommendation is pretty simple: any hate speech that makes it into the Group appears as though the admin is endorsing it, especially if there’s no chance to rebut it. A casual participant might assume your lack of condemnation is essentially a silent affirmation. If you’re like me and you’ve been engaging with people through Facebook Groups, you’ve probably noticed a few where the people argue back and forth, about politics, sports, social issue etc. If you participate long enough in these Groups, you’ll probably notice that some people don’t see each other – they don’t see what certain other people say. This is because one of the two people are blocking. While blocking is expected between feuding ex-spouses, the reasons why people block in discussion groups is less expected: some people only want to engage with people who agree with them. Yes, it’s true. People with super-low self esteem, diminished self-confidence, and who are uncertain of their positions use blocking to maintain the echo chamber their egos can bear. 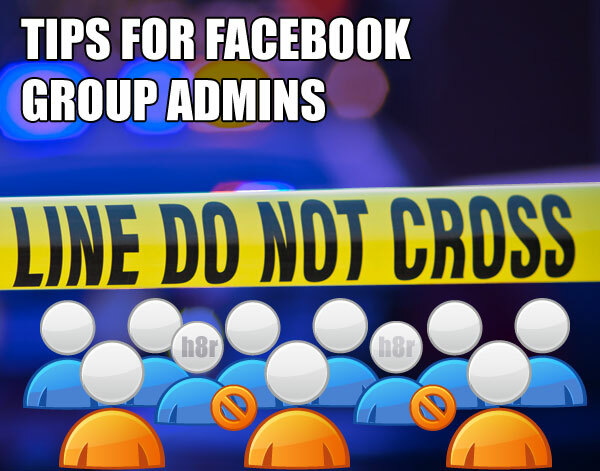 Many Facebook Groups have admins who have a “participants can’t block admins” policy. While this seemed overly stringent to me at first, later on in my position as admin I realized the necessity of the policy. It’s necessary because sometimes extreme participants post something that might reflect poorly on the admin. Without an admin posting their rebuttal or removing the post that’s offensive, for lack of mentioning it the admin appears to be endorsing it, or at a minimum tolerating it. Imagine an editor or publisher of a magazine. Their name is going to be at the top of the list of credits, above the authors. If the authors write articles that contradict the viewpoint of the editor, and the editor doesn’t have a chance to attach an editors note onto the article then it essentially looks like the editor, for having included it, agrees with and endorses the viewpoint. All the explaining after the fact won’t matter once the association becomes a controversy. A few weeks ago, I was asked to admin a Facebook Group I had been a participant in for about a year now that focused on politics. The original admin of the Group operated in a very hands-off, censorship free mode for the first part of the year and it became notorious for it’s vitriol. Everyone argued and spewed some really negative stuff back and forth. Every once and a while someone would threaten someone else and they’d be removed, but for the most part the more conservative messages shared vacillated between simple anger and sentiments toward genocide. For the first couple weeks I operated in a hands-0ff mode, but the last couple days have seen a spike in the vitriol due to the Ferguson riots. The most vitriolic, blindly hateful stuff was being posted by participants who I had rebuked many times for their hate speech, only to have them block me. So here was half a dozen posts of the most repugnant nature, from these same verbal cretins, that I couldn’t rebut. And on top of it all, behind the Members link, was my name listed as one of the three admins, so I felt somewhat responsible for cleaning up what I saw as unacceptably dirty. I started by pruning out the worst comments and posts when I saw them, and I would often give the other active admin the heads-up, as a courtesy, so that if the participants complained to her she’d understand the context of what it was I was deleting. I don’t appreciate having my name associated with a hate group, so I made it clear that my role as admin was only meaningful if I had editorial control. The other admin and I debated the rationale of my editorial direction to the point where it inspired me make this recommendation to other Facebook Group Admins. Since then I’ve been asked by a new participant, someone with very similar views to mine why I support a “smear group”. To this new participant it looked like, since I was an admin of the Group, that I was supporting ugly content because my name is listed as an admin. The bottom line is that people read things with limited understanding and when they do understand something it’s through their lens of experience and expectations. If someone came to the Group who was new, and saw my name as an admin, they might be equally disgusted with the hate speech as I am, but never know my position. Instead the could easily assume my position was that of the participants. Don’t think that you can afford such a liability simply because you can explain it away if someone asks. Most of the time people won’t ask, but instead will assume and infer. If your name is at the top of a Group, a Page, a web site or Publication, people associate that thing with you, no matter what the technicalities are, or even how you’ve disclaimed it. I’ve learned this from monitoring advertising campaigns: that only a small percentage of an audience will buy into something and understand it completely. The rest of the audience forms an understanding or opinion based on only a portion of what’s there. Even if you had the biggest disclaimer in the world attached to things you don’t believe in, a certain portion of the audience will fail to see that disclaimer and attribute the properties of it to whatever name they see first. That’s the way people are, and if you want to profit among them by limiting your liabilities, listen to this guy: it’s best to just pull out and avoid future entanglements. That’s why, in this age of digital relationships and long term retention, you just can’t afford to err on the side of misunderstanding. Hey Jason, great article! I’m admin of a couple groups and have had to boot members who just can’t seem to follow the rules of the group that are in the pinned post, in the cover photo, in the comments, in the about section… you get the idea. It’s not like the rules are hidden! LOL! Anyhow… as I was reading your article I realized that I have no idea how to tell if someone in the group has blocked me or another or the admins. Any hints for me?